Mish's Global Economic Trend Analysis: "UberCab" vs. Al Gore's $90 Trillion Plan to Rid World of Cars: Uber CEO Asks Tesla for 500,000 Autonomous Cars in 2020; Peak Cars? "UberCab" vs. Al Gore's $90 Trillion Plan to Rid World of Cars: Uber CEO Asks Tesla for 500,000 Autonomous Cars in 2020; Peak Cars? A few days ago I received an email from yet another naysayer telling me that I was wrong about self-driving cars and we would not see them in his lifetime. I don't recall precisely how I answered, but it was along the lines of "Are you planning on dying in five years?" Your predictions for self-driving cars and trucks seems to be on track. Looks like interesting times ahead as interest builds. Richard emailed a link to the Green Car Reports article Uber CEO To Tesla: Sell Me Half A Million Autonomous Electric Cars In 2020. Green Car Reports linked to a Forbes article in which Five Top VCs Predict The Future. The CEOs were Jenny Lee of GGV Capital, Steve Jurvetson of Draper Fisher Jurvetson, Rebecca Lynn of Canvas Venture Fund, Bill Gurley of Benchmark Partners and Shervin Pishevar of Sherpa Ventures. Two of the 10 CEO predictions were about cars. The U.S. designed cities around individual car ownership, and the result has been inefficiency, deaths and pollution. U.S. cars are on average idle 96% of the time, which is about $15 trillion in capital assets not used, said Gurley, an Uber investor. Jurvetson: “For those of us who have a chance to be in one, you’ll never go back. I believe they are already safer than my parents.” Initially they will run at speeds of 25 mph or less in urban settings, he said. Jurvetson said Uber CEO Travis Kalanick told him that if Tesla cars are autonomous by 2020, Kalanick wants to buy all 500,000 that are expected to be produced. Whether or not Tesla builds a half-million self-driving cars for Uber is not the point. Nor is a precise date of 2020 important. What's important is the trend. And that trend is both fast and unmistakable. Self-driving cars are coming, far sooner than most predictions suggest. And they will be far safer, with more features. The need for taxi driver, limo drivers, bus drivers, train drivers, and long-haul truck drivers will nearly vanish within 10 years, and five or six would not surprise me at all. The pace of technological advancement is breathtaking. 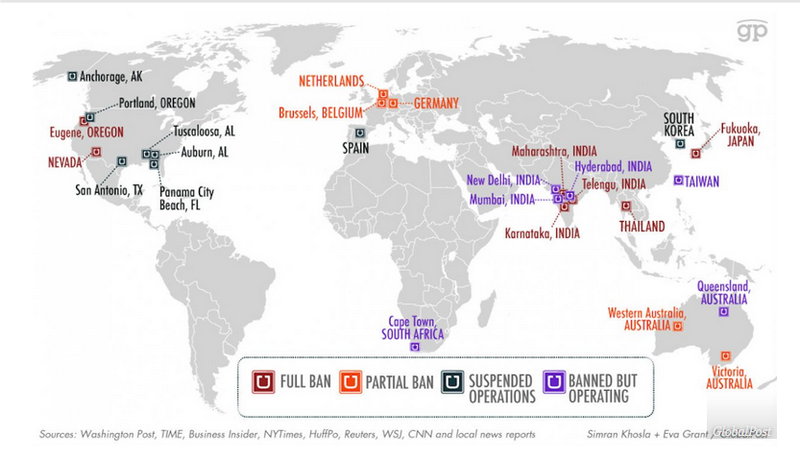 As an important side note, Uber is banned in so many places I lost track. At one point I was accumulating all the places the company was banned. BusinessInsider reports Here's Everywhere Uber is Banned Around the World, then goes on to ask "Will Uber's $40 billion valuation be enough to cover its legal fees?" That map and valuation is as of April 8, 2015. Since then it has been banned in more places. Here is a link to a Google search for "Uber Banned". As is often the case, France is on the forefront of idiotic reactions to technology to preserve over-paying and the French way of life. Two days ago ComputerWorld reported Uber throws in the towel in battle with French taxi drivers. Inquiring minds may be wondering "How can Uber exist with political forces aligned against it?" The answer is simple: Uber provides a service that millions of people want! I receive emails all the time about Uber being banned, about drivers being unresponsive, about drivers not knowing where they are going, and of course about the idiotic reactions in France. But as long as people want Uber, it will not go away. And by 2020 (more or less), there will not be any discourteous Uber drivers, bad drivers, or unresponsive drivers because there will not be any Uber drivers at all. Al Gore to the rescue, NOT. As preposterous as it may seem, Al Gore has a Plan to Spend $90 Trillion to Get Rid of Cars in Cities. "Former Vice President Al Gore and Mexican President Felipe Calderon proposed a $90 trillion plan to redesign every city on earth so that motor vehicles would become obsolete due to more dense populations." Never underestimate the stupidity of politicians and their ridiculously expensive solutions to non-problems that the free market will take care of on its own.